The Creation (German: Die Schöpfung) is an oratorio written between 1797 and 1798 by Joseph Haydn (Hob. XXI:2), and considered by many to be his masterpiece. The oratorio depicts and celebrates the creation of the world as described in the Book of Genesis. The libretto was written by Gottfried van Swieten. The work is structured in three parts and scored for soprano, tenor and bass soloists, chorus and a symphonic orchestra. 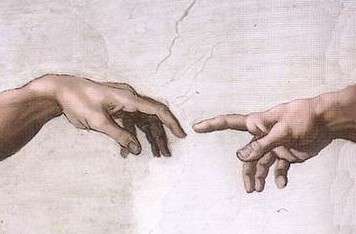 In parts I and II, depicting the creation. the soloists represent the archangels Raphael (bass), Uriel (tenor) and Gabriel (soprano). In part III, the bass and soprano represent Adam and Eve. 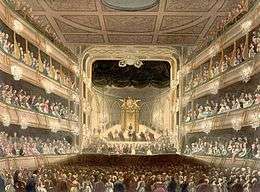 The first public performance was held in Vienna at the old Burgtheater on 19 March 1799. The oratorio was published with the text in German and English in 1800. Haydn was inspired to write a large oratorio during his visits to England in 1791–1792 and 1794–1795, when he heard oratorios of George Frideric Handel performed by large forces. It is likely that Haydn wanted to try to achieve results of comparable weight, using the musical language of the mature classical style. Among the Handel works Haydn heard was Israel in Egypt, which includes various episodes of tone painting, perhaps an inspiration to Haydn's own pervasive use of this device in The Creation. The text of The Creation has a long history. 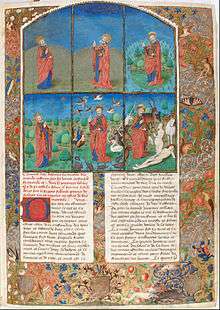 The three sources are Genesis, the Biblical book of Psalms, and John Milton's Paradise Lost. In 1795, when Haydn was leaving England, the impresario Johann Peter Salomon (1745–1815) who had arranged his concerts there handed him a new poem entitled The Creation of the World. This original had been offered to Handel, but the old master had not worked on it, as its wordiness meant that it would have been 4 hours in length when set to music. The libretto was probably passed on to Salomon by Thomas Linley Sr. (1733–1795), a Drury Lane oratorio concert director. Linley (sometimes called Lidley or Liddel) himself could have written this original English libretto, but scholarship by Edward Olleson, A. Peter Brown (who prepared a particularly fine "authentic" score) and H. C. Robbins Landon, tells us that the original writer remains anonymous. When Haydn returned to Vienna, he turned this libretto over to Baron Gottfried van Swieten. The Baron led a multifaceted career as diplomat, director of the Imperial Library, amateur musician, and patron of music. He had already collaborated with Haydn as librettist, editing the text for the oratorio version of The Seven Last Words of Christ , premiered in Vienna in 1796. Swieten recast the English libretto of The Creation in a German translation (Die Schöpfung) that Haydn could use to compose. He also made suggestions to Haydn regarding the setting of individual numbers. The work was published bilingually (1800) and is still performed in both languages today. For the quotations from the Bible, Swieten chose to adhere very closely to the English King James Version. According to Temperley, "the German text corresponds to no known German Bible translation. Instead, it is so constructed that the word order, syllabification, and stress patterns are as close as possible to the English. Haydn and Swieten must have realized that English audiences would not easily accept changes in the hallowed text of their Bible; and there were the formidable precedents of Messiah and Israel in Egypt to bear in mind." In the final form of the oratorio, the text is structured as recitative passages of the text of Genesis, often set to minimal accompaniment, interspersed with choral and solo passages setting Swieten's original poetry to music. Swieten incorporated excerpts from Psalms for choral movements. Haydn lived in this large house, then in the suburbs of Vienna, while composing The Creation. It is a Haydn museum today. Van Swieten was evidently not a fully fluent speaker of English, and the metrically-matched English version of the libretto suffers from awkward phrasing that fails to fit idiomatic English text onto Haydn's music. For example, one passage describing the freshly minted Adam’s forehead ended up, “The large and arched front sublime/of wisdom deep declares the seat”. Since publication, numerous attempts at improvement have been made, but many performances in English-speaking countries avoid the problem by performing in the original German. The discussion below quotes the German text as representing van Swieten's best efforts, with fairly literal renderings of the German into English; for the full versions of both texts see the links at the end of this article. The old Covent Garden theater, site of the English premiere in 1800. Engraving from 1808. The first performances in 1798 were mounted by the Gesellschaft der Associierten, a group of music-loving noblemen organized by van Swieten for the task of sponsoring concerts of serious music; the Gesellschaft paid the composer handsomely for the right to stage the premiere (Salomon briefly threatened to sue, on grounds that the English libretto had been translated illegally). The performance was delayed until late April—the parts were not finished until Good Friday—but the completed work was rehearsed before a full audience on April 29. The first performance the next day was a private affair, but hundreds of people crowded into the street around the old Schwarzenberg Palace at the New Market to hear this eagerly anticipated work. Admission was by invitation only. Those invited included wealthy patrons of the arts, high government officials, prominent composers and musicians, and a sprinkling of the nobility of several countries; the common folk, who would have to wait for later occasions to hear the new work, so crowded the streets near the palace that some 30 special police were needed to keep order. Many of those lucky enough to be inside wrote glowing accounts of the piece. In a letter to the Neue teutsche Merkur, one audience member wrote: "Already three days have passed since that happy evening, and it still sounds in my ears and heart, and my breast is constricted by many emotions even thinking of it." 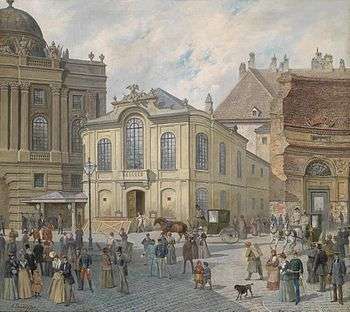 The first public performance at Vienna’s old Burgtheater at the Michaelerplatz on 19 March 1799 was sold out far in advance, and Die Schöpfung was performed nearly forty more times in the city during Haydn’s lifetime. 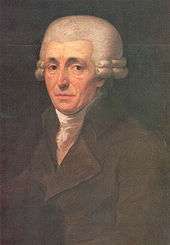 The work became a favorite of the Tonkünstlersocietät, a charitable organization for the support of widows and orphans of musicians, for which Haydn frequently conducted the work, often with very large ensembles, during the remainder of his career. 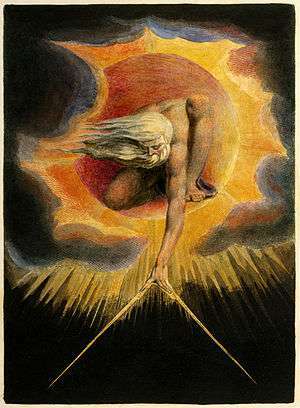 The Creation had its London premiere in 1800, using its English text, at Covent Garden. The 1808 performance of "The Creation" in honor of Haydn; reproduction of a stationery box lid painted in watercolors by Balthazar Wigand. Click to enlarge. The last performance Haydn attended was on March 27, 1808, just a year before he died: the aged and ill Haydn was carried in with great honour on an armchair. According to one account, the audience broke into spontaneous applause at the coming of "light" and Haydn, in a typical gesture, weakly pointed upwards and said: "Not from me—everything comes from up there!" The Creation was also performed more than forty times outside Vienna during his lifetime: elsewhere in Austria and Germany, throughout England, and in Switzerland, Italy, Sweden, Spain, Russia and the United States. Despite the eclipse in Haydn's reputation as a composer that took place during the 19th and early 20th centuries, the work never left the repertoire during this time, and today it is frequently performed by both professional and amateur ensembles. There are many recordings (see below). A typical performance lasts about one hour and 45 minutes. The oratorio is scored for three vocal soloists (soprano, tenor, and bass; there is also an incidental solo for alto in the finale), four-part chorus (soprano, alto, tenor, bass), and a large Classical orchestra consisting of 3 flutes, 2 oboes, 2 clarinets, 2 bassoons, contrabassoon, 2 horns, 2 trumpets, alto, tenor, and bass trombones, timpani, and the usual string section. For the recitatives a harpsichord or fortepiano is also used. There seems little doubt that Haydn wanted a big sound (by the standard of his day) for his work. Between the private premieres for nobles and the public premiere in 1799, Haydn added extra instrumental parts to the work. The forces for the public premiere numbered about 120 instrumentalists and 60 singers. In Parts I and II of the work, the three soloists represent angels who narrate and comment on the successive six days of creation: Gabriel (soprano), Uriel (tenor), and Raphael (bass). 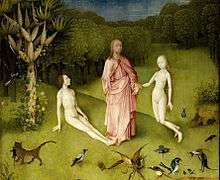 Part III introduces as characters the first man and first woman of the Bible, Adam and Eve, during the time they spent in the Garden of Eden before the Fall. Adam, a bass role, is usually sung by the same soloist that sings Raphael, and the soprano role of Eve is usually sung by the same soloist who sings Gabriel. This was the practice Haydn followed, but some conductors prefer to cast each of the five roles with a different soloist. The choral singers are employed in a series of monumental choruses, several of them celebrating the end of one particular day of creation. The orchestra often plays alone, notably in the episodes of tone painting: the appearance of the sun, the creation of various beasts, and above all in the overture, the famous depiction of the Chaos before the creation. The oratorio is structured in three parts. The first deals with the creation of light, of heaven and earth, of the sun and moon, of the land and water, and of plants. The second treats the creation of the animals, and of man and woman. 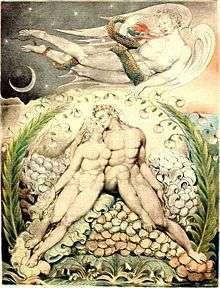 The final part describes Adam and Eve during their happy time in the Garden of Eden, portraying an idealized love in harmony with the "new world". The oratorio is described below, for each part by both a table of the movements and description of individual movements. As in other oratorios, the larger musical numbers (arias and choruses) are often prefaced with a brief recitative; here, the recitative gives the actual words of Genesis, while the following number elaborates the bare Biblical narrative in verse. Choral movements are highlighted in a different background colour. Long recitative for bass in C major. The bass part first gives the words of Genesis 1:6–7, then follows orchestral tone painting, describing the division of the waters from the land and the first storms. Aria in D minor for bass, narrating the creation of seas, mountains, rivers, and (a coda in D major) brooks. As John Mangum points out, the stylistic inspiration here appears to be the "revenge aria" of 18th century opera buffa, as for instance in "La vendetta", from Mozart's Le nozze de Figaro. A view of plant life that Haydn knew well. 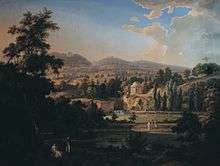 Albert Christoph Dies created this painting of the beautiful palace gardens in Eisenstadt, the property of their shared employer Prince Esterházy. Dies also penned a Haydn biography. The text is based on Psalm 19:1–3, which had been set by Bach as the opening chorus of his cantata Die Himmel erzählen die Ehre Gottes, BWV 76. Haydn's century, following on the discoveries of Newton, had the view that an orderly universe—particularly the mathematically governed motion of the heavenly bodies—attests to divine wisdom. Haydn, a naturally curious man, may have had an amateur interest in astronomy, as while in England he took the trouble to visit William Herschel, ex-composer and discoverer of Uranus, in his observatory in Slough. "Die Himmel erzählen" is not in the home key of Part I, C minor, but is instead in C major, showing the triumph of light over dark. It begins with alternation between celebratory choral passages and more meditative sequences from the three vocal soloists, followed by a choral fugue on the words "Und seiner Hände Werk zeigt an das Firmament", then a final homophonic section. ("The wonder of his works displays the firmament" is the English text here, with word-order calqued from the German, but somewhat awkward compared to the Authorized Version's "And the firmament sheweth the handywork of God".) The unusual intensity of the ending may be the result of Haydn's piling of coda upon coda, each occurring at a point where the music seems about to end. Plum aria for soprano in F major, celebrating the creation of birds. The species mentioned are the eagle, the lark, the dove and the nightingale. 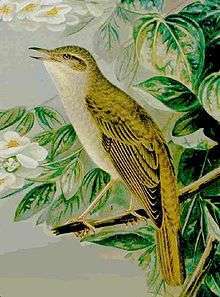 The lyrics include the conceit that, at the time just after the Creation, the nightingale's song was not yet melancholy. Chorus with all three soloists, in A major, celebrating the fifth day. The line "...und ewig bleibt sein Ruhm" is, appropriately, repeated, seemingly without end. A movement of tone painting with bass narration. Haydn's gentle sense of humor is indulged here as the newly created creatures appear, each with musical illustration: lion, tiger, stag, horse, cattle, sheep, insects, and worms. As always in Haydn's oratorio tone painting, the sung verbal explanation comes after the orchestral portrayal. The transition from glamorous animals (the first four) to prosaic ones (the last four) is marked with an unprepared modulation from D flat to A major. The farm animals are portrayed (as in No. 8) with siciliana rhythm, which plainly had bucolic associations for Haydn. Basses who can sing a low D are often tempted to use it on the final note "Wurm", substituting for the D an octave lower than written by Haydn. Sound clip: bass Kyle Ketelson, Creation excerpt #3, from http://www.kylek.net. 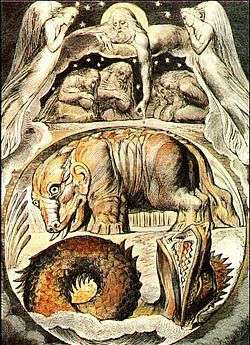 "By heavy beasts the ground is trod": God contemplates his created Behemoth and Leviathan, in an image by William Blake. The first part of the movement contains another brief but notable bit of tone painting: a fortissimo bottom B-flat (sounding in octaves) for bassoons and contrabassoon accompanying the last word of the line, "By heavy beasts the ground is trod." A celebration for chorus alone, in B flat, of the sixth day. In the Biblical story (Genesis 2:1-3) this day was the end of Creation, since God rested on the seventh day, the first Sabbath. The pattern of the last three numbers of Part II, with two celebratory movements on the same theme flanking a slower meditative movement, echoes countless settings of the Latin Mass, where similar or identical choruses on Hosanna in excelsis flank a meditative section on Benedictus. Heil dir, o Gott! Chorus Hail, bounteous Lord! Love duet for Adam and Eve in E flat major. There is a slow initial section, followed by an Allegro. The style is clearly influenced by comic opera, a genre in which Haydn had extensive experience. For some commentators the music evokes the blissful comic duet sung by Papageno and Papagena near the end of Mozart's The Magic Flute. The 2009 recording won a Grammy Award in 2011 and was the top pick by pianist Iain Burnside on the 2013 broadcast of BBC 3'S CD Review – Building a Library. Haydn's original autograph score has been lost since 1803. A Viennese published score dated 1800 forms the basis of most performances today. The score used for performances by the Tonkünstler-Societät in 1799, with notes in the composer's hand, is kept in the Vienna State Library. There are various other copyist scores such as the Estate, as well as hybrid editions prepared by scholars during the last two centuries. ↑ suddenly forte in C major on "light"
1 2 3 4 5 6 Wigmore, Richard (10 January 2009). "Franz Joseph Haydn (1732–1809) / The Creation (Die Schöpfung), HobXXI/2 (1796–8)" (PDF). Barbican Centre. p. 3. Retrieved 29 September 2011. ↑ Temperley, Nicholas (1991). Haydn: The Creation. Cambridge: Cambridge University Press. p. 26. ↑ See Bryan Proksch (2015) Reviving Haydn: New Appreciations in the Twentieth Century. Boydell and Brewer. ↑ Haydn, Joseph (2001). The Creation in Full Score. Dover. ISBN 0-486-41907-X. ↑ See Rosen (1997:372), who offers detailed commentary on this movement. ↑ See, for instance, Richard Wigmore's remarks in program notes: . ↑ Burnside, Iain. "Building a Library: Haydn: The Creation". CD Review – Building a Library. BBC Radio 3. Retrieved 29 December 2013. Rosen, Charles (1997) The Classical Style: Haydn, Mozart, Beethoven. New York: Norton.